Who have you adopted and from where? How old were they when you adopted them? 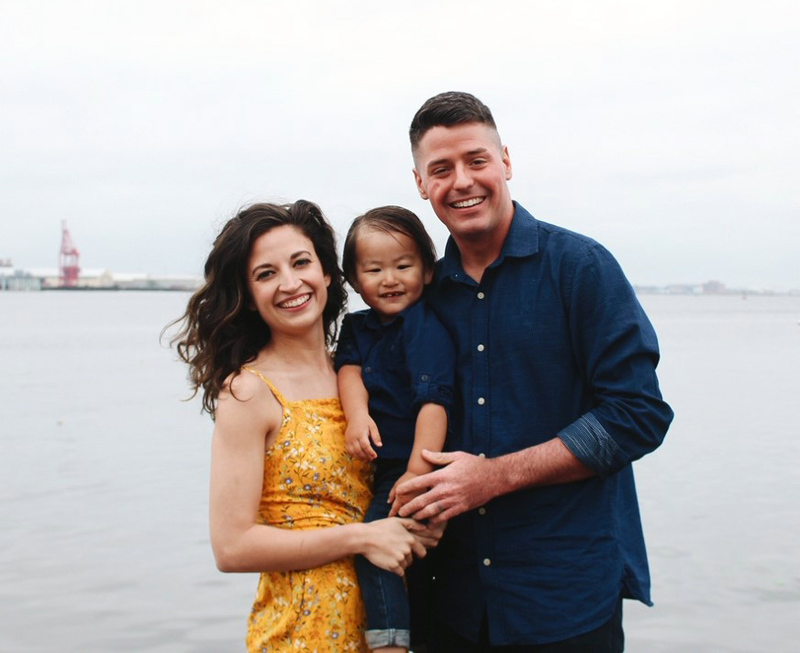 Kandace: We adopted Saja from South Korea last year. He was 17 months old when we arrived home. We are currently adopting a little girl from India, but have not been matched yet. Tell us a little about him and his personality. Anthony: Saja is now 2 1/2 years old and has adjusted really well to us and life here. He has a big personality! He is adventurous, full of energy, loving and hilarious! What made you choose to adopt? Kandace: We are fueled by our faith, and that included our decision to adopt. We see in God’s Word the call to care for the fatherless and we felt God’s personal call for us to choose adoption for our family. We also have been to many orphanages around the world and after seeing and loving those children, we always knew adoption would be a part of our family. Anthony: Growing up with ichthyosis, my parents were great nurturers and providers and in the same way I have always wanted to provide and care for kids that don’t have a family. What has been the greatest challenge or obstacle in adoption? Kandace: The waiting and being so helpless during the process. There are so many people and government offices involved, and most things, including timelines are out of your control. Your faith in the process and patience are definitely tested. Anthony: Waiting, finances and parent/child attachment are three huge obstacles. What has been the greatest blessing? Anthony: Seeing those obstacles be overcome is so inspiring. And the first time you meet your child. Every little step along the way is great with them, but that first moment with them is insane. How has adoption affected your life? Anthony: My empathy has definitely grown. It affects how I look at people because it makes me consider how people around me were cared for and raised. It has made me realize the love that people need. Will there be any more adoptions for you two? Kandace: Possibly! Right now we are focused on our Indian adoption. We are very interested in foster care, and could see ourselves fostering in the future. What do you wish you would have known the first time around? Anthony: I wish we would’ve known that it’s ok to take steps forward even when you don’t know all the information or have all the answers, because those things will all come together during the process. You’ll never have all of that. You’ll never see the whole picture laid out and the source of every dollar. So it’s ok to take steps without knowing that. How is the transition, especially when you're bringing in a child from another culture/country? Kandace: Intense! He was at an age where he understood what his routine was and who his caregivers were but much too young to be able to understand who we were and why everything was changing. So understandably, it was very traumatic. But his foster mom did a wonderful job of talking about us a lot and showing him pictures which helped. And we are thankful for all the training our agency provided us so we could make it as comfortable and easy for him as possible. Did you have to teach Saja English? If so, how did you do that? Anthony: We learned some Korean words which helped initially. Sign language was a huge help to us before he started understanding English. We were really amazed at how quickly he picked up the sign language and began understanding English. Since November is National Adoption Month, who could adopt? Kandace: There are 3 routes of adoption: FostAdopt (adoption through the foster care system), Domestic and International. The requirements for all of those vary but if you have a desire to adopt there is a program that will suit you! What advice do you have for people who have an interest in adopting? Anthony: Take a step! There are 153 million orphans in the world and 108,000 US foster children who are eligible for adoption. Those numbers are overwhelming but each one represents a child in need of a family and if you have room in your heart and home- you will begin a life changing journey. Do your research; see what programs you are interested and find some adoptive families in your community or online who can give you advice and help guide you. starting out it can be hard to even know where to get information. Check out the podcast or email me at AdoptionHacksInfo@gmail.com if you have questions! What advice do you have for people who refrain from adopting because of the high cost? Kandace: It seems overwhelming, but it is doable! There are MANY grant organizations which you can apply for (we received $15,000 for our 1st adoption). There are also interest free loans, matching grants and fundraisers available. If you are willing to work hard and fill out a lot of paperwork - do not let finances be a hindrance. We have also been shocked by friends and family during both adoptions who want to support us. Can you give us a basic summary or overview of the adoption process? Kandace: For international adoption it typically goes like this - First you complete a home study which consists of gathering paperwork, medical checkups, inspections and a couple interviews. Once that is approved you wait for a referral, which is a child you will potentially match with. A referral is chosen by both countries agencies who are looking at your family, the child, your specifications and the child’s needs. Once a referral is accepted, you begin working on citizenship, visas etc. The last step is traveling to the country to complete a court hearing and meet and bring your child home! From start to finish our journey took 14 months. But depending on the country, timelines typically are 1-3 years. What was it like to actually be in Saja's home country and culture? Kandace: The country and people of Korea are so beautiful! We had a great time exploring and soaking up the culture and we want to incorporate that culture and heritage into our family life. Will you tell Saja about his adoption later on in life? Do you have any information on his birth parents? Kandace: Absolutely! We want him to know and understand all aspects of his life and heritage. We understand that there is joy in adoption but also loss. We celebrate the joys and grieve the brokenness. And we want to be fully vulnerable with him as we navigate that together, and of course sharing his story with him age appropriately. His birth parents were very gracious to provide us with a lot of information which we really appreciate. At this time we do not have contact with them but that is a relationship we are very open to having and when Saja is old enough he will be able to make that choice and we will support him in that. We do have a wonderful relationship with his foster mother who cared for him for 15 months. She is an incredibly selfless and compassionate woman who has fostered 26 children. We are forever grateful for the love and care she has for Saja and so glad she is a part of our lives.